(LtoR): Governor Charlie Baker, President Lawrence Bacow, Seth Klarman, Beth Klarman, Dean Nitin Nohria. 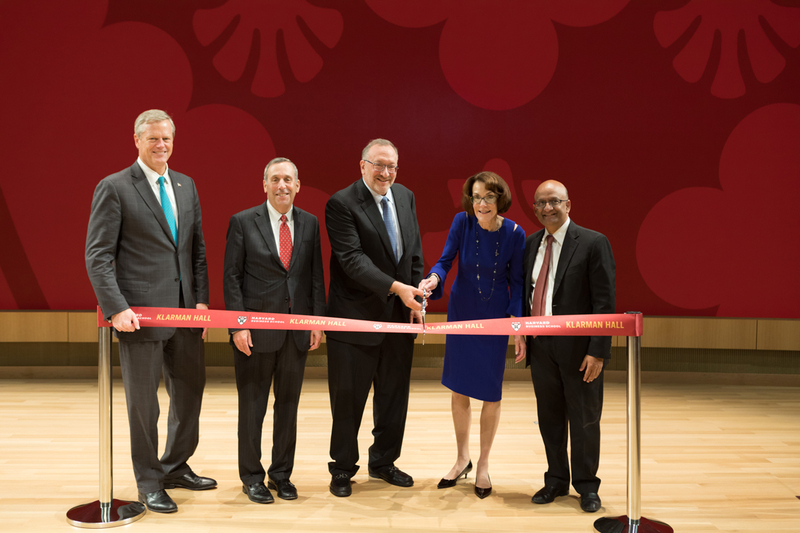 BOSTON—Harvard Business School (HBS) opened its new 1000-seat convening space—Klarman Hall—with a dedication ceremony and symposium last Monday, October 1. The ceremony included remarks by HBS Dean Nitin Nohria, Harvard University President Lawrence S. Bacow, and Massachusetts Governor Charlie Baker. He then recalled the words of the School’s first great benefactor, George F. Baker, whose gift enabled HBS to move from scattered locations in the Harvard Yard to its own campus on Soldiers Field. “I hope and believe that this School is to be the standard for all others,” said Baker at the campus dedication on June 4, 1927. “It must always be remembered that the standard of excellence which must be maintained comes not simply from the outside of the buildings but from the work and training on the inside." Guided by that vision, Dean Nohria explained, the team charged with creating the new building worked towards a space that would be remarkable not just in its design and function, but in the work imagined and created within. The Klarmans embraced those aspirations and encouraged a bigger and bolder concept of a convening space—one whose auditorium could host an entire MBA class as well as more intimate discussions; studios for podcasts, webinars, and online learning; and technology that connects thought leaders from around the world. David A. Moss, the School’s Paul Whiton Cherington Professor of Business Administration, began the symposium by laying out the historical evidence of democratic conflict as a source of progress, arguing that the critical question must be what distinguishes constructive from destructive conflict. Bishop William Lawrence University Professor Michael E. Porter, who is based at Harvard Business School, then shared the stage with Katherine M. Gehl, former president and CEO of Gehl Foods and co-author with Porter of the study “Why Competition in the Politics Industry is Failing America: A Strategy for Reinvigorating Our Democracy.” They offered insights and innovative strategies to address the current political polarity and erosion of US competitiveness in business, social, and economic performance. Martha Minow, 300th Anniversary University Professor and former Dean of Harvard Law School, then moderated a panel discussion with Jeffrey Goldberg, editor in chief of The Atlantic; Michael Klarman, Kirkland & Ellis Professor of Law at Harvard Law School (and brother of Seth Klarman); Yascha Mounck, Lecturer on government at Harvard University; and Bret Stephens, journalist and op-ed columnist at The New York Times. The program came to a close with a “fireside chat” between Dean Nohria; Jamie Dimon (MBA 1982), chairman and CEO of JPMorgan Chase & Co.; and Seth Klarman. The 120,000-square-foot Klarman Hall replaces Burden Hall, which from 1971 to2017 was the School’s venue for large-scale classes, events, lectures, and alumni reunions. The legacy and generosity of the Burden family is remembered and honored by the establishment of 2018’s Burden Park. Architectural firm William Rawn Associates designed the building, which was built by Walsh Brothers Construction and enhanced with surrounding green spaces by landscape architects Reed Hilderbrand, LLC. Technology is a key component of the new facility. Anchored by a 1,250-square-foot video wall comprising 32 million pixels, the Klarman Hall auditorium features an audio system of more than 100 speakers as well as a flexible-seating design that accommodates groups of up 250, 580, or a full house of 1,000. This flexible design allows for smaller gatherings as well as large-scale classes, conferences, and music and art performances. State-of-the-art wireless connections include 80 wireless Ethernet access points, 32 antennas in the auditorium ceiling, and multigigabit Ethernet uplinks throughout the building. The second story and lower-level concourse houses studios to support podcasts, webinars, online learning, and a black box room for videotaping the HBS digital learning platform, HBX. Alongside the requirement for state-of-the-art technological capabilities was the commitment to environmental sustainability. HBS Operations and the project team worked together to deliver a healthy, comfortable, and efficient space. A 75-kilowatt solar photovoltaic array, automated lighting controls, and high-performance glazing are expected to help reduce energy costs by 42 percent. A 3,000-square-foot sedum green roof will reduce storm water runoff, and HBS’s first rainwater storage tank allows for the capture and reuse of rainwater for irrigation. The rainwater storage tank and weather-based irrigation system aim to reduce outdoor water usage by 87 percent. Interior low flow fixtures help to reduce the indoor water usage by 37 percent. An indoor environment ensuring the health and well-being of the building occupants was an additional priority. Klarman Hall is one of the largest new construction projects to follow the University’s guidelines for healthier building products and materials, sourcing furniture, carpet, and building products that do not contain concerning chemicals. The building serves as both a living lab and example for large corporations, helping to transform the marketplace by proving that healthier products can be manufactured and sourced with little to no effect on project delivery, cost, or operational performance.